Timothy Schaffert’s The Swan Gondola has been on my reading list for the past few years. I’m now glad that I finally got around to reading it. It’s a delight. From what I knew about the book – not much – I expected it to be quirky, and it is, and in a good way. The setting is the 1898 Omaha World’s Fair (The Trans-Mississippi & International Exposition). The book is a love story populated with some of the most unusual and colorful characters imaginable. At the center is Ferret Skerritt, ventriloquist by trade, and a hopeful romantic. The object of his affection is the enigmatic and beautiful Cecily, an actress in a traveling troupe who plays Marie Antoinette in a fair horror show. And there is William Wakefield, a wealthy Omaha tycoon and fair investor who disrupts the Ferret and Cecily relationship. Schaffert has an incredible imagination. His characters are finely developed, described as an endearing band of thieves and drunkards. Schaffert’s research for all things surrounding Omaha’s exposition in 1898 is thorough and admirable. He clearly did his homework and wrote his book with highly detailed descriptions of the society, culture, styles, and life near the end of the nineteenth century. Schaffert’s fascination with the Wizard of Oz is notable and noted, mentioning such in the book credits. Authors always earn my appreciation when they describe libraries and librarians in a positive light. And Schaffert does. He also gives recognition to a good number of Omaha librarians in the book credits, along with many others who contributed in one way or another to his research, writing, and eventual publication. 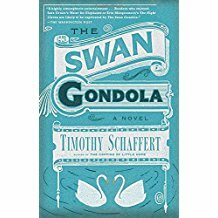 The Swan Gondola is Schaffert’s fifth novel. His earlier novels include the critically acclaimed Devils in the Sugar Shop and The Singing and Dancing Daughters of God. In addition to national recognition and awards, Timothy received the 2003 Nebraska Book Award (fiction) for his The Phantom Limbs of the Rollow Sisters.